Cancer is a refractory disease known to have suppressive activity to patient’s immune system. Although standard cancer therapy plays an important role in weakening the activity of the disease, their efficacy are still limited in advanced cancer, especially by sole treatment. At present, it is considered that “Combination of Cancer Treatments” should be conducted in light of each patient’s symptom. This “Combination of Cancer Treatments” means that specialists in various fields of treatments will closely work together for one patient. Therefore, effective cancer treatment is described as a multidisciplinary treatment, which strategically and effectively is combined by various mixtures of different cancer treatments and expertise of such treatments. Remarkable characteristic of Immuno-Cell Therapy is capable of not reducing therapeutic efficacy of other therapies. It is expected that Immuno-Cell Therapy can become fundamental treatment in combination with conventional standard therapies by supporting effect of these standard therapies. It is statistically known that certain number of patients may experience recurrence or metastasis of the disease in the future, even though all cancer tissue is considered to be resected by surgical operation. Cause of such recurrence may be defined that diagnostic imaging can only detect cancer tissues at 5~10mm, so that less than 5mm of cancer tissue is unable to be detected before surgical operation. In order to prevent recurrence or metastasis of the disease, current preventive treatment, such as chemotherapy, is conducted as a post-operative treatment. Chemotherapy is a systemic treatment, which flows through the bloodstream to every part of the body, and is expected to attack undetected residual cancer tissues. However, since chemotherapy may entail serious adverse reaction, there remains issue of whether a patient should take risk of such adverse reaction, caused by chemotherapy, without confirming existence of the undetected residual cancer tissues. Unlike chemotherapy, Immuno-Cell Therapy usually could not dramatically reduce volume of large cancer mass. 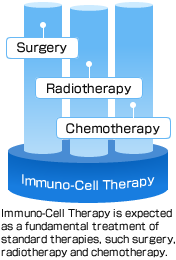 However, Immuno-Cell Therapy is characterized as a systemic cancer treatment and treatment with minimal adverse reaction, so that it may be beneficial for prevention of recurrence, attacking a scattering of undetected residual cancer tissues across entire body. Some medical doctors and patients may think that a combination of chemotherapy or radiotherapy with Immuno-Cell Therapy is not effective since these therapies damage immune system in the body. We, however, recommend taking Immuno-Cell Therapy in combination with other standard therapies, if they are effective. Each therapy has its strength and weakness. For example, it is known that the chemotherapy can greatly reduce size of large cancer mass in some cases, and also can abrogate immunosuppression, caused by cancer, to support appropriate immune response. On the other hands, it is also known that the chemotherapy entails serious adverse reaction for some patients by short and long-term use. Hence, we believe that effective cancer treatment is made by use of strengths and to support weakness of each therapy. For instance, most targeted cancer mass should be reduced or inhibited by either anticancer drug or irradiation. This is beneficial to allow the immune system to overcome cancer. If we can strengthen the patient’s immunity by Immuno-Cell Therapy after chemotherapy or radiotherapy, cancer is likely to be overwhelmed by the patient’s own immune system. We, our doctors, recommend using Immuno-Cell Therapy and other standard therapies in combination to get the most effective outcome from our proven experience. In fact, close to half of the patients in SCG have taken a combination therapy of either chemotherapy or radiotherapy with Immuno-Cell Therapy.